I was drawn to the latest Ottolenghi cookbook like a moth to flame. NOPI, a restaurant concept from the Ottolenghi group, opened in London’s Soho in early 2011, and the book of the same name was released last fall. The intent was for this to be a “grown-up restaurant” with a different feel from the Ottolenghi delis but still without any “stuffiness or formality.” The menu at NOPI is a mix of the flavors Ottolenghi has come to be known for with more Asian influences from chef Ramael Scully. In creating NOPI: The Cookbook , the goal was to revise the dishes from the restaurant to be more easily prepared in a home kitchen, and those changes from the menu are described in head notes. There are also several suggestions for serving parts of recipes in different ways like using sauces for a different type of meat or serving part of the dish on its own. For instance, I probably won’t attempt the complete recipe for White Pepper-Crusted Lamb Sweetbreads with Pea Puree and Miso, but the suggestion to try the pea puree with miso as a dip in place of guacamole sounds fantastic. The Burrata with Blood Orange, Coriander Seeds, and Lavender Oil recipe comes with delicious options like using white peaches, pink grapefruit, roasted red grapes, pickled pears, or kohlrabi in place of the oranges. The Pistachio and Pine Nut-Crusted Halibut with Wild Arugula and Parsley Vichyssoise looks like the picture of spring, and I can’t wait for eggplant season to try the Urad Dal Puree with Hot and Sour Eggplant. Among the desserts, the Caramel Peanut Ice Cream with Chocolate Sauce and Peanut Brittle is extremely tempting. And, there are also brunch dishes and cocktails in the book. The page where I landed first, though, was the one with the Lentil and Pickled Shallot Salad with Berbere Croutons. With colorful sliced beets and radishes, it was a perfect late winter salad. This is the time of year when I find the prettiest radishes in all shapes, sizes, and colors at our farmers’ markets and farm stands. I brought home some pale, purple, not-too-big daikon radishes from Boggy Creek Farm along with their dainty arugula leaves for this salad. First, the Puy lentils needed to be cooked, rinsed, and drained. Meanwhile, shallots were thinly sliced and tossed with olive oil and salt. They were spread into an even layer on a parchment-lined baking sheet and roasted for just a few minutes to bring out the sweetness but not add much color. While still warm, they were sprinkled with sherry vinegar and set aside to cool. Sourdough bread was torn into small pieces and tossed with olive oil and berbere spice which is an Ethiopian chile powder with a little cinnamon among other spices. The croutons were baked until golden. The dressing was a mix of sherry vinegar, lemon juice, Dijon mustard, and olive oil. 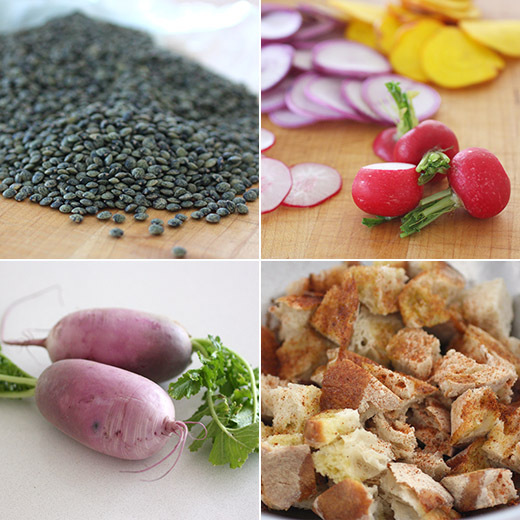 Raw golden beets and round red radishes along with the purple daikons were thinly sliced with a mandolin. 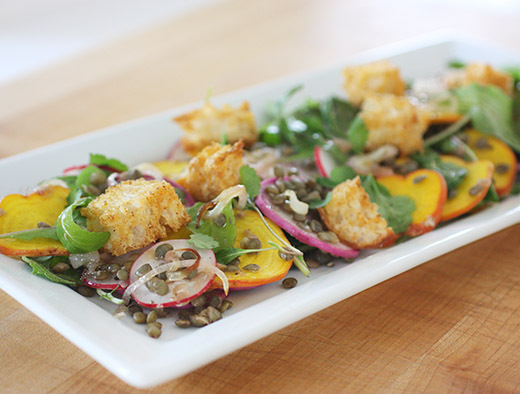 Those were added with the cooled lentils, shallots, cilantro leaves, arugula, and some of the croutons to a bowl to be tossed with the dressing. The salad was served on a platter and topped with the remaining croutons. 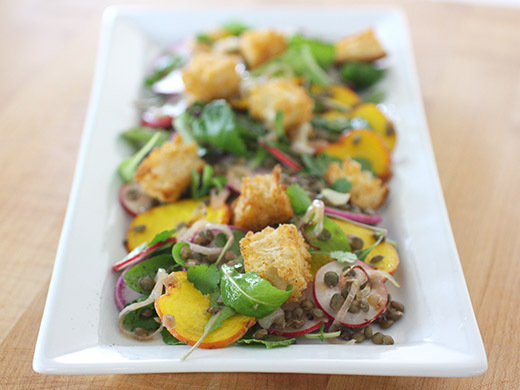 The raw, sharp radishes and earthy beet slices combined well with the lentils in the dressing. The vinegar-soaked shallots added a nice punch of flavor, and crunchy croutons are always welcome especially when they come with the added flavor of spicy chile powder. Seared salmon was a great pairing with this salad and a bit of a twist on the classic salmon and lentils combo. Whether it’s full recipes or borrowed parts and pieces, I’m excited to try more things from this book. Beautiful flavours and colours! This gourmet salad is magnificent. love the colors and the presentation! sounds delicious! The salad looks splendid! I love it. What a gorgeous salad! A delicious way to enjoy lentils. And the cookbook sounds like a winner! Ottolenghi has never let me down. I haven't tried this cookbook yet, but I'm sure it's as fabulous as the others! Your description of this dish as well as your lovely photos has me wanting to make the salad soon. I'm pinning so I won't forget about it.